UPDATED: October 1, 2013 at 10:45 p.m.
As the Faculty of Arts and Sciences continues to chart tight budgets in the aftermath of the 2008 financial crisis, FAS Dean Michael D. Smith and his lieutenants are looking to the Harvard Campaign, the University’s first capital campaign since 1999, for financial relief, according to the Dean’s Annual Report for academic year 2012-2013. The report was presented to faculty at their first meeting of the year Tuesday afternoon and is scheduled to be released to the public Friday. Dean for Administration and Finance Leslie A. Kirwan ’79 reported a budgetary shortfall of $3.7 million for FY 2013 in FAS’s “unrestricted core operations”--those funds available to Smith for FAS’s strategic initiatives and day-to-day activities. She characterized the figure as “a very modest deficit.” FAS’s total budget for the fiscal year, according to the report, was approximately $1.2 billion. 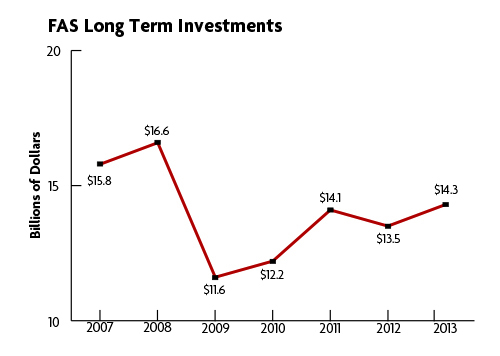 Also in the report, Kirwan wrote that FAS’s portfolio of long-term investments jumped six percent from last year, to $14.3 billion from $13.5 billion. Even so, Kirwan pointed out that the portfolio had not yet recovered to its pre-recession peak of $16.6 billion. Both Kirwan and Smith wrote that FAS’s financial situation is “precarious” and that, to keep from running large deficits, FAS has had to dip into its reserves at an “unsustainable” rate. “The budgetary balance we have achieved together is a huge accomplishment, but our financial situation remains precarious given the nation’s and world’s unstable environment,” Smith wrote in the report. At the height of the global economic crisis in the fall of 2008 and the spring of 2009, Smith instituted a hiring freeze and across-the-board budget cuts to help remedy a projected two-year budgetary shortfall of $220 million. But years of careful guidance have allowed FAS to largely avoid projected deficits, and in FY 2012 the school managed to balance its budget for the first time since the financial crisis. Yet Smith and Kirwan lamented that years of conservative budgets, while necessary to remain fiscally secure, forced unwelcome tradeoffs within FAS. “This year we were able to cover our core expenses, but this same budget provided very little in flexible funds with which we could invest in the many priority needs of our faculty and students,” Smith wrote in the report. Kirwan and Smith wrote that as a result of the budgetary difficulties, FAS will rely on support from the Harvard Campaign, which was launched in September and is the University’s first major fundraising drive since 1999. Smith said at Tuesday afternoon’s Faculty Meeting that the FAS portion of the Harvard Campaign will launch on Oct. 25 and 26. Identified priorities for FAS mirror those specified by the University and include Financial Aid, House Renewal and the Student Experience, Leading in Learning, Faculty and the Scholarly Enterprise, SEAS, and the Dean’s Leadership Fund. Kirwan wrote that this forward thinking, combined with the planning and priority-setting that FAS has undertaken in preparation for the Harvard Campaign, will encourage the campaign’s positive impact. “The planning and preparation we have done during this period will ensure the Harvard Capital Campaign—while not a panacea—will directly address both academic priorities and financial pressures in the FAS,” she wrote. The annual report, which runs 88 pages, covers a number of major trends and themes from within FAS over the last year, including faculty diversity and tenure and promotion practices. The document includes detailed reports from each of FAS’s major academic divisions, as well as the College, the Graduate School of Arts and Sciences, the Division of Continuing Education, and the School of Engineering and Applied Sciences.